Only the purest tea. Smooth & subtle. 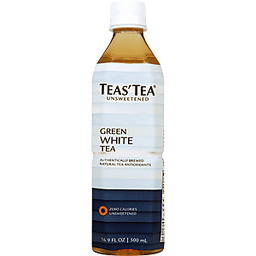 Brewed with premium, whole green & white tea leaves. USDA organic. 0 calories per bottle. Mellower in taste than green tea, the newly budding white tea contains the largest amount of antioxidants among tea leaves. Ethically sourced teas from sustainable tea farms. 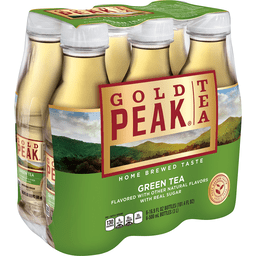 Authentically brewed using only premium, whole leaf teas. Powerful tea antioxidants to neutralize free radicals and promote heart health. Teastea.com. Non GMO Project verified. nongmoproject.org. Certified organic by Bioagricert srl. BPA free. Natural tea leaf sediment may be present. Teas' Tea comes from the Japanese phrase ocha no naka no ocha, which simply means the tea of all teas. Thoughtfully sourced and mindfully made, Teas' Tea brings out the best in our world to create only the purest tea. Haiku: a rabbit hops into the disappearing dawn new year's moon. - Michelle Schaefer. Product of Thailand. 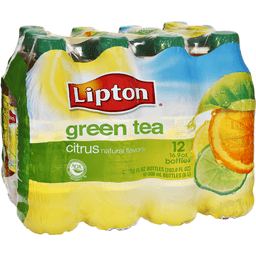 Lipton® Citrus Diet Green Tea. Flavor with other natural flavors. Per bottle. 0 calories. 0g sat fat, 0% DV. 170mg sodium, 7% DV. 0g sugars. 12-16.9 fl oz bottles. (202.8 fl oz) 12-500 ml bottles (6 L). 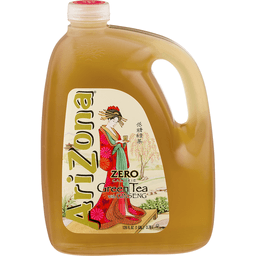 Contains 0% juice - Low sodium, 140mg or less per 240 ml (8 fl oz.) Caffeine content: 22mg/16.9 fl oz. Product questions Call 1-800-657-3001. www.liptontea.com. ©Lipton. 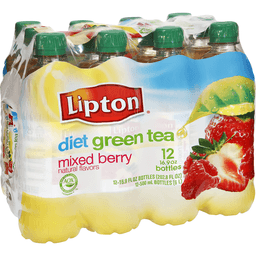 Lipton® Diet Green Tea Mixed Berry. Flavor with other natural flavors. Per bottle. 0 Calories. 0g sat fat, 0% DV. 170mg sodium, 7% DV. 0g sugars. Contains 0% juice. Low sodium. 140mg or less per 240ml (8 fl oz). Caffeine content: 22mg/16.9 fl oz. www.liptontea.com. Product questions Call 1-800-657-3001. ©Lipton. Flavor with other natural flavors. 0 calories per 12 fl oz serving. 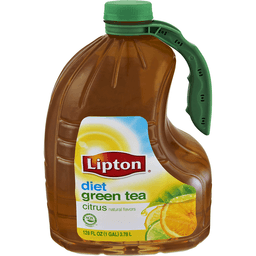 Lipton Diet Green Tea Citrus is perfectly infused with our unique blend of real green tea and citrus essence for a delicious taste that refreshes your body and mind. Enjoy the taste of sunshine from Lipton Iced Tea! Contains 0% juice. Sugar free. Low sodium. Caffeine Content: 16 mg/12 fl oz. www.Liptontea.com. Product questions? Call 1-800-657-3001. Please recycle. 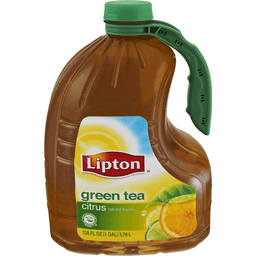 Lipton® Citrus Green Tea. Flavor with other natural flavors. Per bottle: 100 calories. 0g sat fat, 0% DV. 105mg sodium, 4% DV. 27g sugars. 12-16.9 oz bottles (202.8 fl oz). 12-500 ml bottles (6 L). Contains 0% juice - low sodium. Manufactured by independent Producers for The PEPS/Lipton Tea Partnership. ©Lipton, Englewood Cliffs, New Jersey 07632. Caffeine content: 22mg/16.9 fl oz. www.liptontea.com. Product questions Call 1-800-657-3001. Unilever. Family size tea bags. Specially blended for iced tea. Family owned since 1902. Authentic Southern iced tea - it's so simple, yet so satisfying. It leaves you reinvigorated and refreshed. At Luzianne, we know refreshment is something on which you should never compromise. It's why we carefully select tea leaves from across the globe and specially blend them for iced tea. 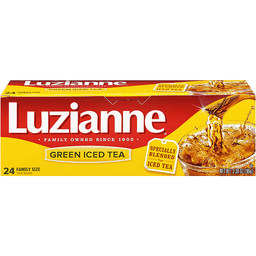 Since 1902, our family company has been taking the extra steps so you can enjoy the clear, smooth, refreshing taste of Luzianne from one pitcher to the next. And once you've taken a sip of Luzianne, we believe you won't settle for anything less. 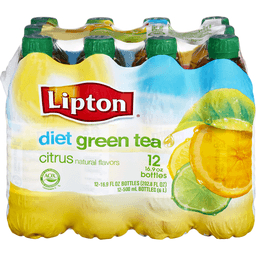 Did You Know: 1 box brews over 6 gallons; 1 box equals 48 - 16 oz bottles of iced tea. 100% natural antioxidants. Your satisfaction guaranteed. www.luzianne.com. Please include best by date when contacting us. This product contains 22 mg of caffeine per 8 fl oz serving. 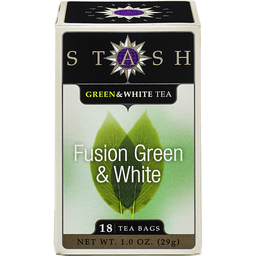 Stash Green & White Tea Fusion Green & White. Premium. Explore our world of tea. Since 1972, Stash has been dedicated to providing premium quality teas. Stash begins with tea leaves from the world's premier tea gardens and the finest herbs and spices gathered from around the globe. Our master blenders combine these botanical ingredients to create unique and delicious teas that are 10010 natural and free of artificial flavors and colors. Whether you enjoy caffeine free herbal teas, green teas, black, white, oolong or decaf teas, with Stash you get a wide range of exceptional teas that have been expertly blended for full flavor in every cup. Fusion green & white. Green & white tea. Rare and expensive white tea from China has been blended with top quality green teas for our Fusion blend. Pale gold in color, this tea has a unique smooth flavor and a hint of sweetness. Its delicate, exquisite taste is a treat for the connoisseur. 100% Natural ingredients. Select blended green and white teas. Sustainable Forestry Initiative. Certified sourcing. www.sfiprogram.org. Recyclable. Shop our full line of teas, unique tea gifts, teapots and accessories, or request a free catalog. www.stashtea.com. 100% natural. Not from concentrate. 110 calories per 12 fl oz serving. 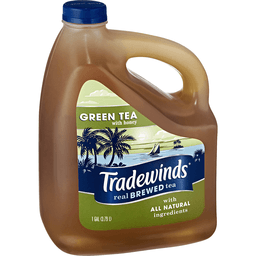 At Tradewinds, we believe there's just something special about our slow-brewed tea. That's why we take the time to make it right, with simple, 100% natural ingredients. So whether you're hanging with friends or just enjoying me time, there's nothing more refreshing than our slow-brewed tea. www.drinktradewinds.com. Please recycle.